Bobrisky donates to help Lagos 57 gay suspect – Rights Africa – Equal Rights, One Voice! One of the Lagos 57 gay suspects, Obialor James Brown, has received a cash donation of 100,000 naira (about U.S. $275) from controversial Nigerian bleaching cream entrepreneur Bobrisky to support his health. 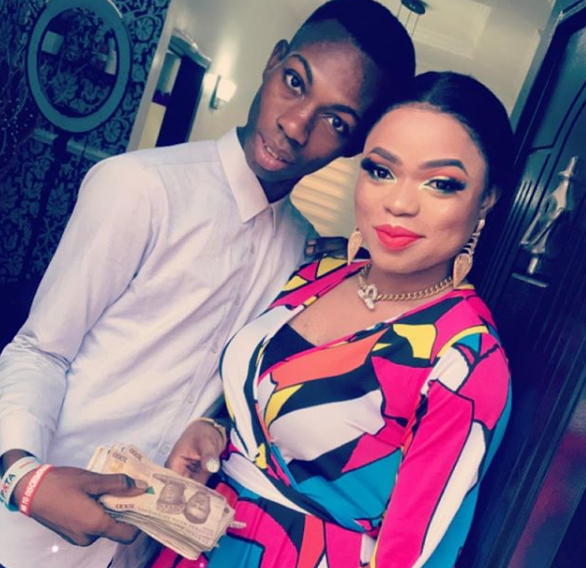 Obialor James Brown (left) and cross-dresser and entrepreneur Okuneye Idris (Bobrisky) pose with Bobrisky’s donation. Okuneye Idris, who is popularly known as Bobrisky, shared on Instagram that he was moved to support Brown for courageously speaking out about his HIV-positive status and for defending himself after he was arrested together with 56 others and then paraded before the media by the police in Lagos two months ago. Brown shared videos of the two of them on Instagram dancing and showing off the money that Bobrisky donated. In recent weeks, Brown has been enjoying massive attention from the media, and the number of his followers on social media has increased rapidly, making him an instant celebrity. Recently, he was interviewed on “Bar Room Therapy,” a Nigerian cable TV show.